SNOLAB is a world-class science facility located deep underground in the operational Vale Creighton nickel mine, near Sudbury, Ontario in Canada. The combination of great depth and cleanliness that SNOLAB affords allows extremely rare interactions and weak processes to be studied. 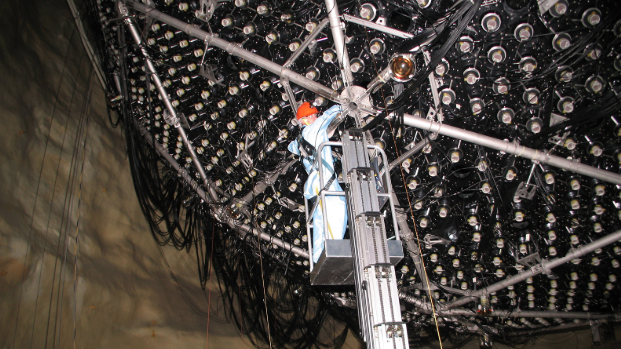 The science programme at SNOLAB is currently focussed on sub-atomic physics, largely neutrino and dark matter. At 2km, SNOLAB is the deepest clean room facility in the world. Dr. Erica Caden completed her PhD at Drexel University working on the Double Chooz neutrino experiment. As a research scientist, Erica is involved in the neutrino projects at SNOLAB (SNO+ & HALO) as well as science education and outreach activities. For SNO+, she is the detector manager responsible for keeping the experiment running smoothly day to day.